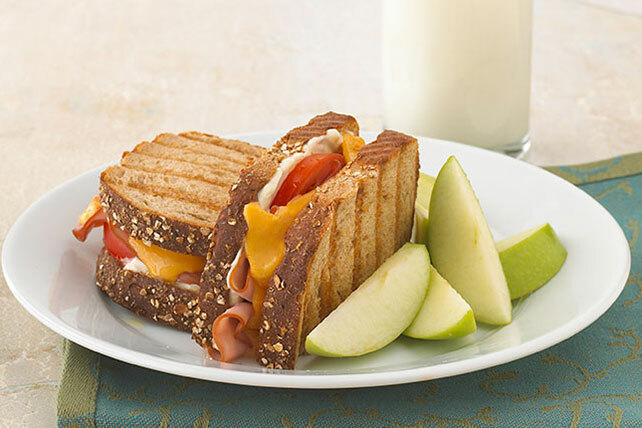 Sandwich ham, tomatoes and cheese between slices of multi-grain bread for Grilled Ham Panini. Dining on this Grilled Ham Panini is simple and oh-so-yummy. Spread bread slices with dressing; fill with remaining ingredients. Cook in heated grill pan or small skillet sprayed with cooking spray on medium heat 5 min. on each side or until golden brown on both sides. Serve with 1 cup cantaloupe chunks and an 8-oz. glass of fat-free milk. For added flavor, spread a little additional MIRACLE WHIP Dressing onto outside of sandwich before grilling. No need for cooking spray. Prepare using MIRACLE WHIP Light Dressing, KRAFT 2% Milk Singles and adding 1/2 cup baby spinach leaves.